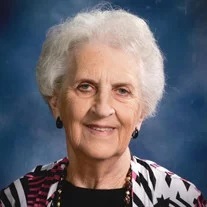 Joyce Fay Green Bryson, 82, of Ringgold, was carried away by angels on Monday, October 15, 2018 into the presence of the Lord that she loved and served. Her loving family was by her side to pass her from this world to her new home. She is preceded in death by her husband, Earl Lebron Bryson; parents, Bill and Martha Lou Land Green; and siblings, Evelyn James, Ronnie Green, Ralph Green and Linda Hixon. She has been reunited with many family members and close friends. Left behind, for now, to cherish her memory are her daughters and sons-in-law, Fay and Steve Wood, of Ringgold and Debbie and Kevin Marcus, of Ringgold; grandchildren, Becky Steed (Travis), Aaron Wood (fiancé Cassi Woods) and Lauren Marcus; great-grandchildren, Merritt and Evelyn Steed; brother, Doug Green (Nita), of Tunnel Hill; sisters, Betty Rivers (Jim), of Ringgold, Judy Babb (Wendal), of Ringgold and Jewel Silvey (Lamar), of Ringgold; and several nieces, nephews, family and friends she has touched along the way, too numerous to count. Mrs. Bryson retired from the Catoosa County School System after more than 30 years of working in various cafeterias. She was a member of Catoosa Baptist Tabernacle and teacher/member of the Ladies Bible Learners Sunday School class. She loved singing in the choir, groups and solos in area churches. She was a former member of Welcome Hill Baptist Church, where she taught children’s and ladies’ Sunday School. Mrs. Bryson lived a simple and meaningful life of service to others. She spent many hours visiting others. She loved writing poetry and short stories. The story of her childhood was published in 2009 in Brush Brooms and Straw Ticks. Known as “Nana” to all of her babies, she showed unconditional love and led by example as a woman of strength and grace. She made ordinary days extraordinary for her children, grandchildren and great-grandchildren. She and her husband, “Papa,” created a lifetime of memories by making mud pies, cooking, gardening, digging up worms, playing hop scotch and searching for four leaf clovers. Funeral services will be held at 2 p.m. Thursday, Oct. 18 in the funeral home chapel, with Rev. Jerry Atkins and Rev. Justin Gazaway officiating. Interment will follow at Anderson memorial Gardens. The family will receive friends noon-8 p.m. Wednesday and from 11 a.m. until funeral time Thursday at the funeral home. Arrangements are by Wilson Funeral Home Wallis-Stewart Chapel - Ringgold.